Sister Elizabeth Kovacs entered the Society of Sisters of Social Service while she was imprisoned in her native Hungary for illegal religious activities. As she later told the story in her biography, before being arrested in December 1955 for giving religious instruction, she had asked the leaders of the order to be accepted as a novice. But after many religious people were arrested, most activities were suspended, said Sister Maria Almasy of the Sisters of Social Service. After a period of solitary confinement without an answer to her application, Sister Kovacs was given a cellmate, a nun from the Hungarian order of the Sisters of Social Service. She anxiously asked whether her application had been accepted, and she was told that it had. So Sister Kovacs counted May 4, 1956, as the day she became a novice in the order. 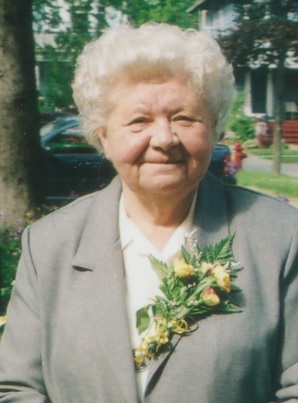 Sister Kovacs died March 29, 2019, at the age of 89 in the Clarence residence of the Sisters of St. Joseph, where she had been living. After the Hungarian revolution at the end of 1956, with four other “underground novices,” Sister Kovacs fled her native country, arriving in the United States in May 1957. She continued her novitiate and made her first vows in Syracuse in 1960. From 1982 to 2007, and then informally for many more years after retirement, Sister Kovacs worked with the elderly and the sick of St. Aloysius Parish in Cheektowaga, visiting and taking communion to the elderly and ill at home, in nursing homes and hospitals. Elizabeth Kovacs was born in Western Hungary, the second of three daughters of a Catholic family. As a teenager, she attended a Catholic high school, went to Mass daily and was active in the local Catholic Youth Organization. But all religious activities were curtailed in the mid-1950s, when Hungary joined the Warsaw Pact during the Cold War and Russian influence increased. Sister Kovacs worked in an office during the day but in her free time secretly gave religious instructions to grammar school and high school students. Shortly before her arrest, her apartment was searched and religious articles were taken and she noticed that she was being followed. On Dec. 26, 1955, Sister Kovacs was arrested and taken to prison. Six months passed before she was allowed to contact her family, who didn't know what had happened to her. At first she was isolated and interrogated but she eventually received a cellmate, Sister Lenka, a Sister of Social Service whom she knew from the C.Y.O. The Sisters of Social Service order was formed in Hungary in 1923 with a focus on assisting refugees, women, and children, supporting civil rights and opposing war and the death penalty. After fleeing to the United States, Sister Kovacs began her formal noviative and was assigned to work with children as a group mother at the House of Providence in Syracuse. She worked there until 1969, taking classes part-time at LeMoyne College from 1960 to 1967. In late 1966, she became an American citizen; in May of 1967 she made her final vows. She finished her undergraduate education at D'Youville College in Buffalo, graduating in 1972 with a bachelor's degree in social work. Returning to Syracuse, she ministered at St. John the Baptist Parish from 1973 to 1980. Her assignment at St. Aloysius began in 1982 and formally ended when she retired in 2007, but continued informally for many more years. "She always was so energized after any meeting or encounter with the parish people," said Sister Almasy. "She really loved them so dearly." In her religious community, Sister Kovacs served as treasurer of the U.S. District starting in 1980. She served on the District Council several times and she was chapter delegate in 1975 and 1991. "She was really eager to do everything, to her last breath," said Sister Almasy. "She had a huge hope in Christ, and she was in a deep relationship with the Blessed Mother. She prayed the Rosary all the time when she could not sleep." On the occasion of her golden jubilee in 2006, Sister Kovacs wrote, "Being a Religious for 50 years has given me an opportunity to serve the needy, the neglected, and the poor of society. I have felt the Holy Spirit was present and active in my walk on this long journey. ... My only desire is to serve God's people as long as I can, and pray that He will bless this effort." A Mass of Christian Burial was offered Tuesday in Blessed Sacrament Roman Catholic Church in Buffalo.